In every Competitive exam, one of the most important section is Reasoning. If you get good score in Reasoning test then it will help you to achieve good marks in competitive exams. This can be achieve only if you have a very good reasoning skills. According to logic and type, reasoning is basically divided into few sections. Logical Deduction is one of them. The first premise states that all objects classified as "men" have the attribute "mortal". The second premise states that "Socrates" is classified as a man ? a member of the set "men". The conclusion states that "Socrates" must be mortal because he inherits this attribute from his classification as a man. One way to solve Logical Deduction is the Venn-Diagram method. But the problem is that it is tedious, lengthy and complicated too. Hope everybody agrees with it. “Logical Deduction” is a deductive argument in which conclusion has to be drawn from two propositions referred to as premises. 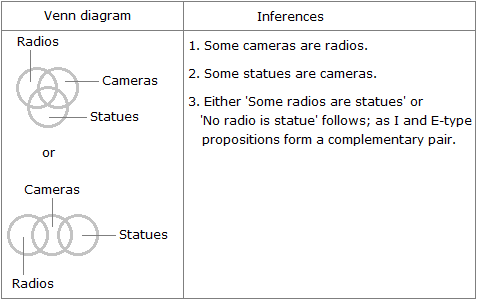 A Proposition (or a categorical statement) is a statement that asserts that either a part of, or the whole of, one set of objects - the set identified by the subject term in the sentence expressing that statement - either is included in, or is excluded from, another set - the set identified by the predicate term in that sentence. 1. Quantifier: The words 'all', 'no' and 'some' are called quantifiers because they specify a quantity 'All' and 'no' are universal quantifiers because they refer to every object in a certain set, while the quantifier 'some' is a particular quantifier because it refers to at least one existing object in a certain set. Quantifier: All, No, Some, Atleast, Atmost etc. Some/Atleast/Atmost: Particular Quantifiers(as it refers to atleast one existing object in a certain set). 2. Subject (denoted by 'S'): The subject is that about which something is said. 3. Predicate (denoted by 'P'): The predicate is the part of the proposition denoting that which is affirmed or denied about the subject. 4. Copula : The copula is that part of the proposition which denotes the relation between the subject and the predicate. 1. Universal Affirmative Proposition (denoted by A): It distributes only the subject i.e. the predicate is not interchangeable with the subject while maintaining the validity of the proposition. e.g., All snakes are reptiles. This is proposition A since we cannot say 'All reptiles are snakes'. 2. Universal Negative Proposition (denoted by E): It distributes both the subject and the predicate i.e. an entire class of predicate term is denied to the entire class of the subject term, as in the proposition. e.g., No boy is intelligent. 3.Particular Affirmative Proposition (denoted by I): It distributes neither the subject nor the predicate. e.g.,Some men are foolish. Here, the subject term 'men' is used not for all but only for some men and similarly the predicate term 'foolish' is affirmed for a part of subject class. So, both are undistributed. 4. Particular Negative Proposition (denoted by O): It distributes only the predicate. e.g., Some animals are not wild. Here, the subject term 'animals' is used only for a part of its class and hence is undistributed while the predicate term 'wild' is denied in entirety to the subject term and hence is distributed. 1. Conversion: The Conversion proceeds with interchanging the subject term and the predicate term i.e. the subject term of the premise becomes the predicate term of the conclusion and the predicate term of the premise becomes the subject of the conclusion. The given proposition is called convertend, whereas the conclusion drawn from it is called its converse. Ex. No fish is whale. E: No P is S.
Ex. Some boys are poets. I: Some P is S.
2. Obversion: In obversion, we change the quality of the proposition and replace the predicate term by its complement. A: All birds are mammals. E: No birds are non-mammals. E: No poets are singers. A: All poets are non-singers. I: Some nurses are doctors. O: Some nurses are not non-doctors. O: some politicians are not statesmen. I: Some politicians are non-statesmen. 3. Contraposition: To obtain the contrapositive of a statement, we first replace the subject and predicate terms in the proposition and then exchange both these terms with their complements. A: All birds are mammals. A: All non-mammals are non-birds. I: Some birds are mammals. I: Some non-mammals are non-birds. Note: The valid converse, obverse or contrapositive of a given proposition always logically follows from the proposition. Term : In Logic, a term is a word or a combination of words, which by itself can be used as a subject or predicate of a proposition. 1. Major Term : It is the predicate of the conclusion and is denoted by P (first letter of 'Predicate'). 1. All dogs are animals. 2. All tigers are dogs. Here 'animals' is the predicate of the conclusion and so,.it is the major term. P.
'Tigers' is the subject of the conclusion and so, it is the minor term, S.
'Dogs' is the term common to both the premises and so, it is the middle term, M.
Major And Minor Premises : Of the two premises, the major premise is that in which the middle term is the subject and the minor premise is that in which the middle term is the predicate. 1. The conclusion should not contain the middle term. Conclusion: Some girls are men ; all girls are men. Explanation: In the above example neither of the conclusion is valid, as the middle term i.e. girls is present in both the conclusions. Conclusions: All cows are dogs; some dogs are cows. Explanation: Here, in conclusion 1 the term “Cow “is distributed but it is not distributed in the premise i.e premise-2 since it is a A-type proposition and the term “Cow” to be distributed must be the “subject” (Refer table-1) of the proposition. 3. The middle term (M) should be distributed at least once in the premises, otherwise no conclusion follows. Conclusions: All watches are fans; Some fans are black. Explanation:In the above premises the middle term is “watches”, since it is not distributed in both premises(refer above table for distribution conditions) no conclusion can be drawn except the conversions of the premises. 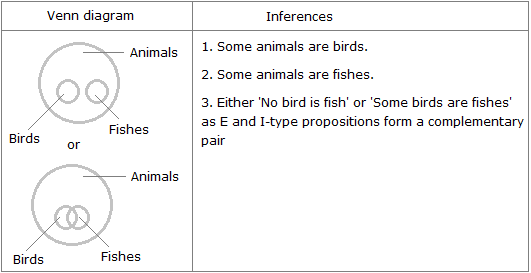 (a) If both premises are particular i.e I type. (b) iIf both premises are negative i.e. E-type. 2. Some cherries are mangoes. Since both the premises are negative, neither conclusion follows. 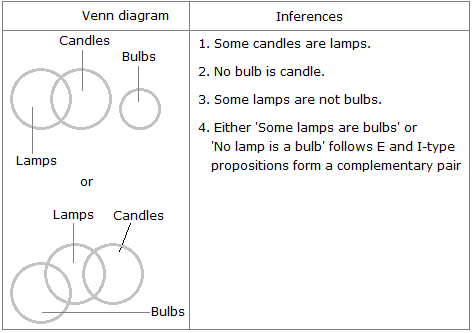 Let us study the various possible cases and draw all possible inferences in each case, along with verification through Venn diagrams. Case 1: All men are boys. All boys are students. The converse of first premise i.e. 'Some boys are men' and the converse of second premise i.e. 'Some students are boys' both hold. Since both the premises are universal and affirmative, the conclusion must be universal affirmative. Also, the conclusion should not contain the middle term. So, it follows that 'All men are students'. The converse of this conclusion i.e. 'Some students are men' also holds. Case 2: All birds are animals. All fishes are animals. The converse of first premise i.e. 'Some animals are birds' and the converse of second premise i.e. 'Some animals are fishes' both hold. Both, being A-type propositions, distribute subject only. Thus, the middle term 'animals' is not distributed even once in the premises. So, no definite conclusion follows. Case 3: All puppets are dolls. Some dolls are rattles. The converse of the first premise i.e. 'Some dolls are puppets' and the converse of the second premise i.e. 'Some rattles are dolls', both hold. First premise, being an A-type proposition, distributes the subject only while the second premise, being an I-type proposition, distributes neither subject nor predicate. Since the middle term 'dolls' is not distributed even once in the premises, so no definite conclusion can be drawn. Case 4: Some writers are players. All players are musicians. The converse of the first premise i.e. 'Some players are writers' and the converse of the second premise i.e. 'Some musicians are players', both hold. Since one premise is particular, the conclusion must be particular and should not contain the middle term. So, it follows that 'Some writers are musicians'. The converse of this conclusion i.e. 'Some musicians are writers' also holds. Case 5: All boxes are toys. Some boxes are clips. The converse of the first premise i.e. 'Some toys are boxes' and the converse of the second premise i.e. 'Some clips are boxes', both hold. Since one premise is particular, the conclusion must be particular and should not contain the middle term. So, it follows that 'Some toys are clips'. The converse of this conclusion i.e. 'Some clips are toys' also holds. Case 6: All buses are vans. 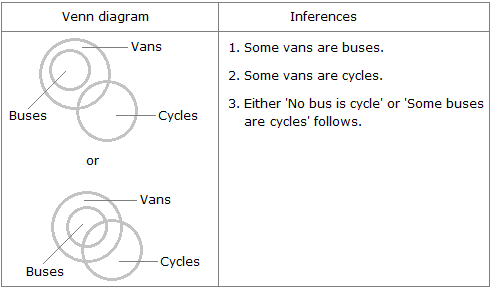 Some cycles are vans. The converse of the first premise i.e. 'Some vans are buses' and the converse of the second premise i.e. 'Some vans are cycles', both hold. First premise, being an A-type proposition, distributes subject only and the second premise, being an I-type proposition, distributes neither subject nor predicate. So, the middle term 'vans' is not distributed even once in the premises. Hence, no definite conclusion can be drawn. Case 7: Some radios are cameras. Some cameras are statues. The converse of the first premise i.e. 'Some cameras are radios' and the converse of the second premise i.e. 'Some statues are cameras', both hold. Since both premises are particular, no definite conclusion follows. Case 8: All cakes are candies. No candy is pastry. The converse of the first premise i.e. 'Some candies are cakes' and the converse of the second premise i.e. 'No pastry is candy', both hold. Since both premises are universal, the conclusion must be universal. Since one premise is negative, the conclusion must be negative. So, it follows that 'No cake is pastry'. The converse of this conclusion i.e. 'No pastry is cake' also holds. Case 9: No coin is ring. All rings are bangles. The converse of the first premise i.e. 'No ring is coin' and the converse of the second premise i.e. 'Some bangles are rings', both hold. First premise, being an E-type proposition, distributes both the subject and the predicate. Second premise, being an A-type proposition, distributes the subject. Thus, the middle term 'ring' is distributed twice in the premises. So, the conclusion cannot be universal. Also, since one premise is negative, the conclusion must be negative. Thus, the conclusion must be particular negative i.e. O-type. 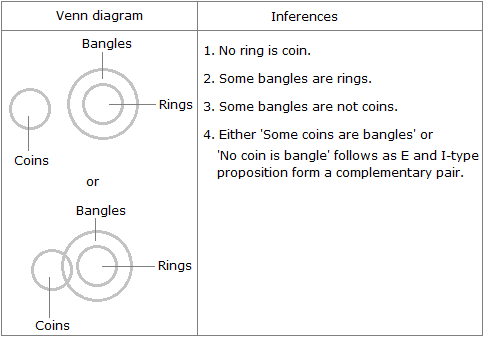 So, it follows that 'some bangles are not coins'. Case 10: Some lamps are candles. No candle is bulb. The converse of the first premise i.e. 'Some candles are lamps' and the converse of the second premise i.e. 'No bulb is candle', both hold. Since one premise is particular and the other negative, the conclusion must be particular negative i.e. O-type, So, it follows that 'Some lamps are not bulbs'. 3. The converse of the derived conclusions.